MOORE: “No, I don't, really – especially-- I realize that uhm, that that far right, they have created a fictional character that they need to hate – he happens to be called Michael Moore, but it’s not really me, they don’t know the real me. They don’t know, ya know, I went to the seminary to be a priest or that I’m an Eagle Scout or, you know, I’m very much in love with the people of this country and what this country stands for. And the way that they try to manipulate the truth about me, it’s like they really must want to make sure that people don't listen to what I'm saying and yet with every film the audience has only grown and I think that’s because people know that I’m going to come out there and speak the truth. Michael Moore really loves getting up on that soapbox and sermonizing to the poor and downtrodden, enlightening all of America with the "facts." Unfortunately Moore seems to have forgotten a few of these little "facts" in his rush to propagandize regular Americans into believing that socialized medicine is the answer. While most of the mainstream media, PBS and Tavis Smiley are all too willing to hop aboard the Michael Moore truth-wagon, those that actually do a little research will find a different story; Michael Moore tells the truth the same way Baghdad Bob did. 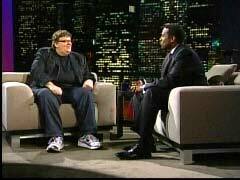 Michael Moore forgot to include a few tasty bits like these two found in a recent article by MTV's Kurt Loder. The article states that France's health care system -- lovingly touted in Moore's film – is 2.7 billion dollars in debt. Another fact that apparently Moore doesn't think is important enough to tell the American people, and which can be found in Loder's article, is that according to French Health Minister Philippe Douste-Blazy "our [talking about France] health system has gone mad. Profound reforms are urgent." The excellent piece by Kurt Loder, (who assuredly can't be grouped in with the "far-right" that Moore rails against) is a perfect example of what people are not seeing. Loder unloads on Moore for skewing facts about Cuba, Canada and Great Britain and for making a completely one-sided movie. But wait, if that's not enough to cast Moore's heart wrenching and factual movie into question there's even more. Getting back to the Tavis Smiley "interview", a part at the end where Michael Moore, good ol' fashioned blue collar boy that he is, decries the wage gap between Whites and African Americans. SMILEY: "Earlier tonight here on PBS we just saw a 90 machine conversation with the democratic candidates running for the white house and the issue of healthcare, of course, comes up in this conversation. Tonight was uniquely different, in terms of conversation, because it focused in on the concerns of people of color. Talk to me about the disparity in this industry and how much more often people of color find themselves between a rock and a hard place, because of the way the system is rigged." MOORE: “Well first of all, you just had the statistics that just came out about the median household incomes in America. $50,000 per household if you are white, $30,000 if you’re black. I mean, just saying that number right there should just send a chill down anybody's spine if they consider themselves an American that there is that wide of a gap still. So, if you are in the $30,000 household income and you’re not covered and only 9% of the Non-government workforce belongs to a union, so if you don't have a good plan you have to pay for your health insurance, some people are paying $1,000 a month, I know people paying $2,000 a month for their premiums, you know, funding the whole family with the premium. This always affects those who are poor, people of color always are getting slapped down first with this and the thing is, here’s the thing, is that if you don't have health insurance, let’s say you are poor, black, in this country, you don't have health insurance you don't go to the doctor. People who have health insurance go to the doctor right away. If you put off going to the doctor, you know, the disease only gets worse. And we rarely talk about dentistry too. This is something we never talk about how dentistry isn’t covered and yet so many things begin because people have bad teeth and if you have bad teeth you end up not being able to eat fruits and vegetable, fresh fruits, you gotta eat the simple carbohydrates, you know the kind of soft foods that don't process well that then you don't become a very well person as a result of that, and it just one thing leads to another. Moore is obviously making a heck of a lot more than 50,000 dollars a year -- The LA Times reports that he will get 50% of the gross profit from SiCKO's box office. Perhaps Moore's next movie will deal with the fact that not everyone in America makes the exact same amount of money and will advocate outright redistribution of resources and the end of free-market capitalism. The list of "facts" left out or skewed by fearless crusader Michael Moore goes on and on. A CNN report by Sanja Gupta , and documented by NewsBusters contributor Brad Wilmouth, found that Moore had gotten the "facts" wrong about the amount of money spent for each patient in Cuba and America. Moore said America spent $7000 per person where as Cuba spends only $25. Actually according to CNN America spends $6,028 to Cuba's $229. While that may still seem like a lot, especially considering both Cuba and America have roughly the same life expectancies, it's just more proof that "facts" don't really mean much to an intrepid investigative documentarian like Moore. Moore also leaves out the part about how President-for-life Fidel Castro got gravely ill last year, he didn't bother using the wonderful Cuban health system that Moore touts, instead he had a specialist flown in from Spain. I wish I was done with giving you a list of "facts" that Michael Moore left out of his movie, unfortunately that's not the case. [I understand if you need a quick intermission, stretch your legs, so grab some popcorn, or even some cheesy poofs from Mr. Moore - don't worry he's on a diet now, he wont miss them. Moore, who constantly gushes over the Canadian health care system, failed to mention that in Toronto there is a thriving businesses that specializes in "transporting Canadians who don't want to wait for medical care to Buffalo, New York." In dealing with Great Britain, Moore leaves out the part about 1,000,000 Britons that are in line for medical coverage and the 200,000 more that are in line... to be in-line. These facts are also brought to you by MTV’s Loder, who apparently didn't have all that much trouble finding them. It's a wonder how someone like Moore, a veteran "documentary" filmmaker, could have overlooked them in his quest for the truth. When the "facts" are 100% skewed in favor of one side, its not a documentary, it's propaganda. Yet of this was deemed important enough by Mr. Smiley, as he didn't ask a single question that could have called into the validity of Moore's film. I've seen Letterman ask tougher questions of Pauly Shore. This wasn't an interview, it was a way for Michael Moore to air his indignation and for Tarvis Smiley to gush over Moore's new movie.